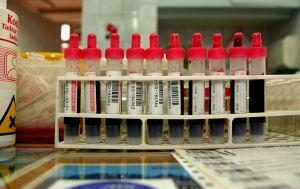 A blood test is one way to check for drug addiction. Each of the various screening tools for drug addiction can have benefits. However, the thing to remember is that a screening can only provide preliminary information. If an initial screening suggests drug abuse is a problem for an individual, than a full diagnostic assessment should be completed. Screening someone correctly for a substance abuse problem relies on mainly one key point - asking the right questions. When a screening tool does ask the correct questions it can be a useful first level drug addiction assessment tool. The reason screening tools do work is because most of the time, drug addicted individuals don't understand what's normal and what's not related to drugs. And individual may even think that they have a problem, and want to hide it. However, because many don't understand what normal substance use looks like they won't know how to lie about their drug use, and instead, tend to answer questions truthfully. There are literally hundreds of drug addiction screening tools. Following is information about some of the most well-known drug screening tools available. The Brief Drug Abuse Screening Test (B-DAST), often called simply DAST, is one of the fastest drug abuse screening tools around. This makes it useful if a patient is distraught, or maybe won't talk for long. It's only 20 questions long and extremely easy to understand. DAST is not for alcohol addiction. This screening tool assesses specifically for non-alcohol drug use. When giving the DAST, a health care professional should inform the individual taking the screening that by, "Drugs," the test means either non-medical use of drugs, or drugs that are prescribed or over-the-counter, but taken in excess of a recommended dose. The DAST can also be given as a self-assessment drug screening test. See what the DAST looks like. The original CAGE screening tool is super fast, and assesses for signs of alcoholism. The CAGE tool is good for health care professionals because it's easy to remember. It may not be as handy though for patients. There is some criticism that CAGE is gender slanted towards males, so females may not be as well assessed with it. The original CAGE lists four questions that are simple to understand. Each can be answered with a single yes or no. For example, the first question is "Have you ever felt you ought to cut down on your drinking?" Each of the next three questions are much the same. If an individual answers at least two questions with a "Yes", that shows a high probability for alcohol abuse. View the original CAGE screening tool. There's a newer CAGE-AID which has been adapted to include drug use besides alcohol. For example, the first question on the newer CAGE is, "Have you ever felt that you ought to Cut down on your drinking or drug use?" As you can see, by looking at the original CAGE first question, they've simply added the word, "Drug." It works in the same way as the original. View the CAGE-AID screening tool. A toxicology screening (or blood or urine test) is one way to check for drug abuse. Using blood and urine tests as screening tools for drug addiction is a bit controversial though. Most often this is a tool used in workplace screenings, or for sports team members. Many people feel that it violates basic rights, and also, that it's not entirely accurate. You can be a non-addict and have a test of your blood or urine come out positive, thus indicating drug addiction. One way that urine and blood tests are more accurate is that some tests can measure the actual level of drugs in someone's system. Measurements also vary with the type of drug. Some drugs leave the body system quickly, while others can stick around in trace amounts for a month or longer. There are also prescription drugs and even some food products that can skew blood and urine test results. Read more about the MAST. Finally, the screening tools for drug addiction shown above are merely the tip of the iceberg. There are plenty of screening tools available for all ages, education levels, and both genders. However, it's important to note that one of the best screening tools is a regular physical check-up. If you're concerned about someone being addicted to drugs or even concerned about your own drug issues, a doctor's appointment is a good first step. A doctor can offer you all the best screening tools, discuss which ones may be most useful to an individual situation, and offer advice about drug addiction treatment.